Turns out I should have read the label before deciding to shake my drink. There was a bit of sediment on the bottom and I thought I would mix it in. Bad idea. 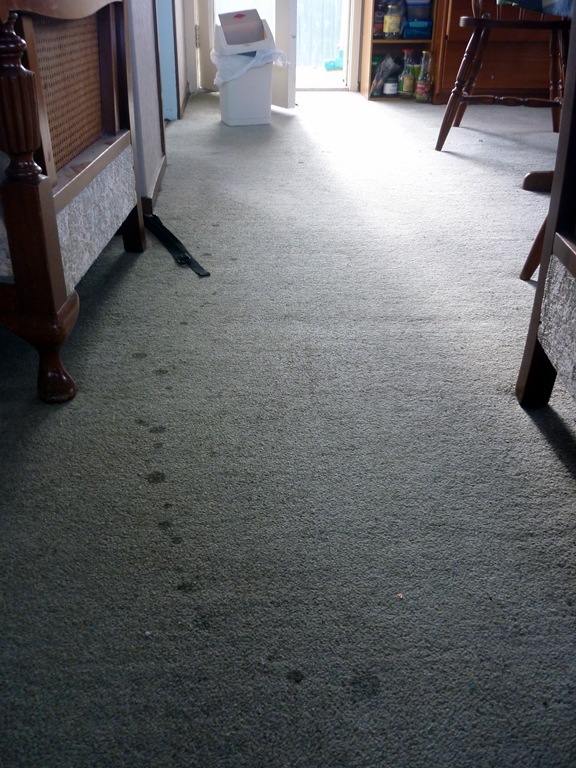 The part where it says it is carbonated might have warned me about the huge explosion of bubbles that sent me running towards the door. I tried another another drink from ieProduce, a health store nearby, today. Other bloggers have written about how delicious some kombucha teas are and they are meant to have lots of health benefits so I thought it would be a good, healthful treat for another sunny, spring day. Once I got past the off-putting colour and the explosion of fizz on my carpet, this drink was really nice! Wikipedia tells me kombucha tea is made by fermenting tea. The slight yeasty taste vaguely reminded me of home-made ginger beer. 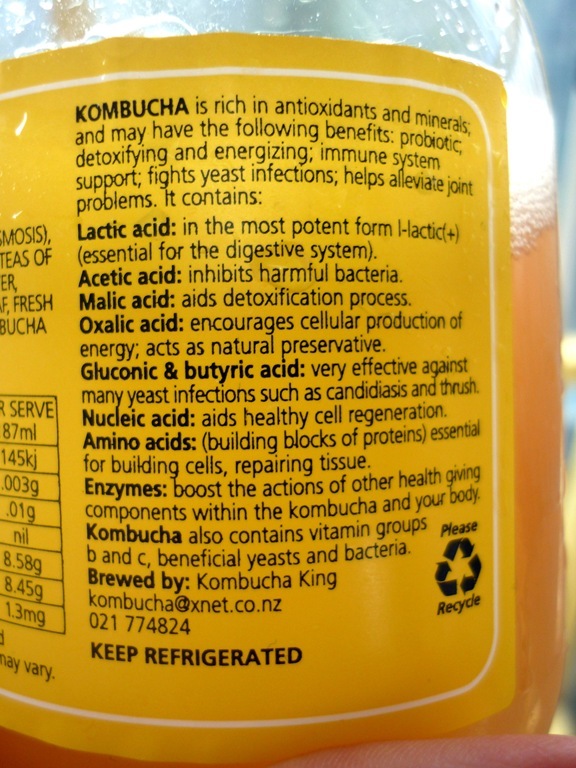 If you check out the label (above), you’ll see that kombucha tea supposedly has many health benefits but I can’t find any scientific studies with evidence to support this. Apparently drinking this tea can actually be harmful to some people so with no proven benefits maybe it should be avoided? Shame it tastes so good – price rather than caution will probably stop me from buying it again. I thought I’d share something with you that I tried for the first time today – coconut water. I’ve seen it online, in the health food stores and endorsed by celebrities. I’m not one to try something just because Madonna and Demi Moore have been snapped with it, but was intrigued anyway. Coconut water is just the liquid inside young coconuts. 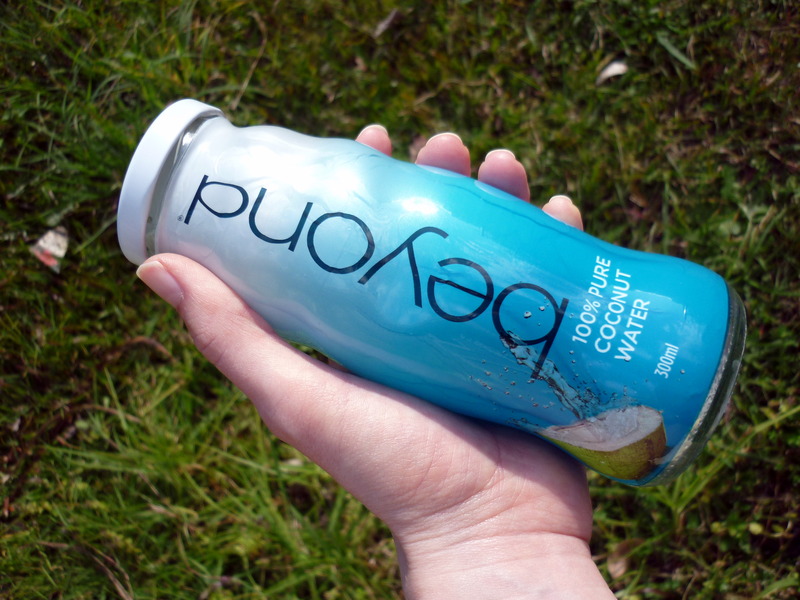 The Beyond Coconut Website says that coconut water hydrates faster than water and is all natural. It is also high in potassium, fat-free, free of added sugar and lower in acid than sports/soft drink. I’m no athlete so I’m pretty sure I don’t need the electrolytes it contains but thought I’d give it a go for something different. I picked up a bottle this morning and saved it for after my interval-training workout to see if it lived up to the hype. The taste wasn’t quite what I was expecting and the water was a little thicker than I anticipated too, but it was very cool and refreshing. I drank this bottle after a few glasses of water and still needed more after so I wouldn’t say that it quenched my thirst but it had a pure, clean taste and I felt a lot better about drinking it than if I had drunk a diet-soft drink or bottled juice. At $4 for a 300mls I definitely won’t be having it often but it might become a summer-time, shopping day treat. Don’t get me wrong, I love the concept of a green monster but the thing I just couldn’t get my head around was that they are GREEN. After some excessive Friday night fruit pie eating, I felt like a healthy kick after my workout this morning and the bag of spinach in the fridge was staring me down so I decided I’d finally try my first Green Monster. 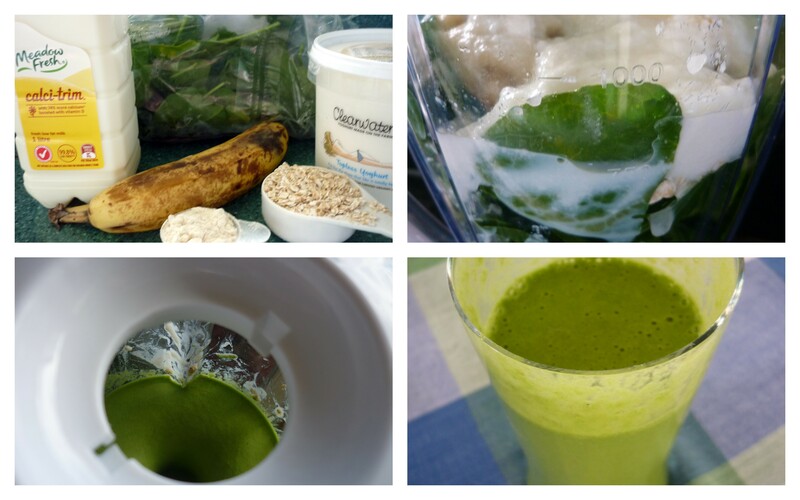 I used spinach, banana, oats, vanilla whey powder, milk and yogurt. The smoothie tasted great! It was sweet and smooth. If you were colour-blind you would have no idea it had veges packed into it! Apparently if you are concerned about your iron intake you can steam the spinach first to make it easier for your body to absorb but I didn’t bother with this. I didn’t add ice because I was concerned my feeble excuse of a blender wouldn’t cope, but I should’ve definitely either refrigerated or frozen my banana beforehand or added ice because it was a bit warm. I can’t wait to try this smoothie again with different ingredients. I think a peanut butter-banana smoothie may work quite nicely!